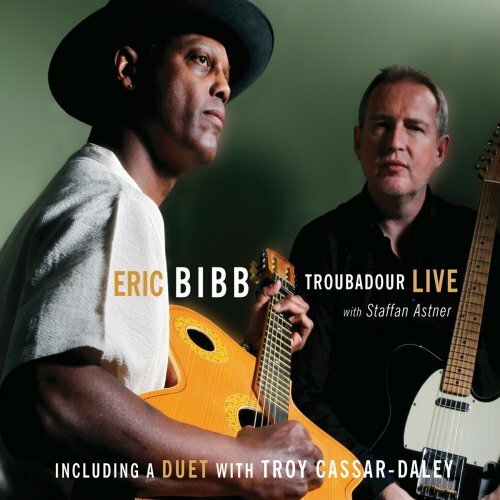 It's easy to dismiss acoustic music as mellow but it's often incorrect as it is on Eric Bibb's Troubadour Live! He is a thoughtful songwriter and gifted performer who could deliver a quality set of quiet, polite fare but that's not what this is. Yes, it's acoustic-based and intimate but there is real energy, intensity, and passion in these performances. Bibb opens on his own and gives such a beautiful performance of Guy Clark's "The Cape." He sings clearly with a deep connection to this song as well as his own material and the stories, themes, and people in the songs and does so with minimal affectation. He relies on that connection and his guests to provide color and detail. Staffan Astner joins Bibb for the remainder of the show and members of Psalm4 join them for the final three songs. Astner's electric lead adds fire and injects energy without destroying the show's intimacy. He holds back and augments Bibb's acoustic picking. He is effective throughout, often playing restrained, melodic leads and beautiful tone. The duo of Bibb and Astner perform three songs from Booker's Guitar, Bibb's most recent studio album. "Tell Riley" is inspired by and a tribute to Riley B. King, better known to the world as B.B. King. It's a great song and Astner plays some B.B.-esque licks on it as homage. His lead work on "Walkin' Blues Again," is forceful yet minimalist, complementing Bibb's acoustic picking. Psalm4's Glen Scott adds piano to the mix and it brings depth to "Connected" as Astner again delivers outstanding lead guitar. Some artists are swallowed by their guests or overshadow them but that doesn't happen on Troubadour Live. Bibb maintains his central role and benefits from the sympathetic contributions from his guests. By the time the remaining members of Psalm4 -- Andre De Lange and Paris Renita -- join Scott, Astner, and Bibb on "New World Comin' Through," they have transcended the blues and created a soaring gospel-soul hybrid. Troubadour Live is the kind of record that sticks with you long after it has finished. Live albums rarely deliver on the promise but this does, providing a rich, deep, spiritual experience and it can be relived because someone had the good sense to roll tape.